Want to know how to become a PMP? Here are the 10 steps we recommend to become a certified PMP®or CAPM. Step 1. Start with a Strong "Why"
Getting certified is a project! And you've likely found that when you embark on a project, a key question that needs to be answered during Initiating is "Why are we doing this project?" So, why do you want to get your certification? I've found that a strong why--a compelling motivation--can help fuel you for the work that is necessary to get certified. Even if you are a highly seasoned project manager, you will need to invest time that you probably don't have using materials you likely don't own, keeping you from things you'd rather be doing! Maybe it's because you want to set yourself apart from the rest of the pack? Sure, there are hundreds of thousands PMP's worldwide, but there are far more project managers that aren't certified. Why not show you're one of the best? Maybe it's because you want to show your current employer that you're passionate about developing into a more effective leader. You're not satisfied with status quo--you want to be and do more. This certification can send that message. Maybe you want to prove to yourself that you can face a challenge like this and complete it. It's very satisfying to set a goal like this and then deliver on it. Many desire to do so. Few do it. Why not you? Whatever your motivation, I suggest you treat this certification as a project. Your Strong Why is like the Business Needs that drive the project. You'll want to identify stakeholders that will be actively involved in helping you succeed. Consider us as one of those stakeholders! Brainstorm constraints, assumptions, and objectives. Indeed, you are embarking on a project--one that you will look back at with pride for the rest of your career. One of the best places to learn more about the PMP®and CAPM certifications is the respective credential handbook from PMI. They take less than a half hour to read and will answer many of your initial questions. When you read the Credential Handbook, you likely noticed that an important part of the PMP®application process is to document your work experience. In short, PMI wants to verify that someone earning the PMP®is not just a smart college graduate who is good at taking tests! They want to make sure you've actually been doing project management work, regardless of whether that was your title or not. The CAPM does not have a work experience requirement. How much experience do you need to document for the PMP? Well, it depends if you have a Bachelor's or equivalent degree or not. The work experience requirement is higher if someone does not have a Bachelor's degree. How about if you have a Master's degree? Or a Doctorate? Unfortunately, there's no reduction in hours because of the advanced degrees. You'll still need to report the 4,500 hours on your application. Your work experience hours need to have been accrued during the last eight consecutive years. You need experience with each of the five process groups (Initiating, Planning, Executing, Monitoring & Controlling, and Closing), though not on every project. Let's assume someone has a Bachelor's degree. They need to demonstrate at least 36 unique months of working on projects and a total of at least 4,500 hours. Let's say Project A went from January-October last year, for a total of 1,200 hours. Project B went from July-December last year for a total of 800 hours. How does this get reported on an application? Project A would count as 10 months toward the 36 unique months. The months of July-October cannot be double-counted so Project B does not get credit for those months. However, the total hours for both projects count. Thus, the totals for those two projects on the application are 12 unique months and 2,000 hours. You get to count the overlapping hours but not the months. Unless you consistently work more hours, assume a 40 hour week when working on your application. In most cases, someone could not be full-time on Project A during August and full-time on Project B at the same time, thus working 80 hours a week that entire time. I'm often asked questions about if someone's project hours qualify or not. It's usually asked in the context of "I was more of a team member than a project manager." So, do the hours count or not? Demonstrate sufficient knowledge and experience to appropriately apply a methodology to projects that have reasonably well-defined project requirements and deliverables." 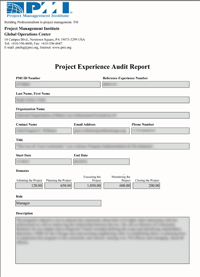 You need to have responsibilities of "leading and directing" for each project you list on the experience verification form. Your descriptions for each project need to be able to make it clear the leading and directing included cross-functional teams. Be thorough in your application descriptions. Though each project doesn't need hours in each of the five domain areas, make sure you have coverage for all five across all the projects. Make sure to indicate how you had to lead and direct within constraints of schedule, budget, and resources. Make sure your descriptions and claims are truthful. Not only is it the right thing to do, your application may be audited (requiring a signature per project from a boss/sponsor/etc.). For either the PMP® or CAPM® certifications, you need a certain number of education hours. This ensures you have received training that is aligned with PMI's standards. The number of hours depends on which certification you are pursuing. If you have any question about our prep materials, please don't hesitate to contact me. If you are aiming for CAPM® certification, the application is very straightforward. You'll need to document the courses you took, including the class names, dates, and the number of contact hours. Make sure to keep a copy of the certificates of completion in case you get audited. If you're pursuing PMP® certification, the education component is the same. You need 35 contact hours instead of the CAPM's 23, but the documentation is easy. The real work for the PMP®is documenting your experience leading and directing projects. Unless you keep amazing records, getting the information can be a challenge. And going back 8 years? Some days I have trouble remembering last week, let alone 8 years ago! So here's what I recommend.... Start with your most recent projects and work backwards in time. If you're confident that have far more than the necessary hours over the last 8 years, focus on the projects with the most number of hours. If your projects tend to be smaller in terms of hours, no problem! Just start documenting your most recent projects and work your way back. We have a spreadsheet that can help you document your work experience and consolidate your hours. Click here and we'll send you the free spreadsheet and other tips to help you navigate the certification journey. The primary contact person can be either a sponsor or supervisor to vouch for what you documented (hours, dates, descriptions). For those people who are challenging or impossible to get in touch with, you can use team members who were close enough to the project to verify your submission, if you get audited. The single most important tip is to get started! Since this process of documenting projects can feel overwhelming, try this: use the spreadsheet and document just one project. Just doing this single step will help. Applications are randomly selected for audits (see below for more information about the audit process). One of the best ways I know to prepare for an audit is to assume it will happen. How does that help? If you get audited, you will need a physical signature from your primary contact person, validating the information you submit. So, since you are assuming you'll get audited, you should call or email each contact person to let them know you are pursuing certification. Let them know what information you are submitting and that, if you are audited, you will need them to sign-off on that information. Ask them if they would have any hesitation to do so. By being proactive about this before submitting your application, the audit process will go much faster with less stress, if you get selected. To start entering your application online, go to http://certification.pmi.org. If you don't currently have an account with PMI, you can create one for free. Registering on the website is not the same as joining PMI. Registering is free. There's a cost to become a member of PMI. You'll likely want to join PMI before you finalize your application since it will save you money on the cost of the exam. But you cannot start your application without at least registering on the website. You can enter your application in multiple sessions--the information you enter is saved for 90 days. Once you have successfully completed the application, submit it and wait for approval. The costs are high enough to be sufficient motivation for most of us to make sure we pass it the first time! See if your employer is willing to pay the exam costs. Why pay for it yourself if your manager is able to do so? Once your payment is accepted, the next screen that is displayed will indicate if you will be audited or not. You'll need to get a handwritten signature for each project from the primary contact person you identified in your application. For example, if the same contact person was used for 5 projects, you'll need to get the paperwork for the 5 projects to the contact person, who will provide a signature for each project. Once the contact person signs for each related project, they will place the paperwork in a sealed envelope. They will put their signature on the flap of each envelope to prove it was not opened. In addition to these envelopes, you will send in copies of training certificates to verify you attended and completed the classes you included on your application. All of this material is then snail-mailed to PMI. Most people tell me they can complete this process in two weeks or less if they stay focused. Once your application is accepted and you made it through the audit, it's time to schedule your exam. You don't have to schedule it quite yet--you have a year to take the exam up to 3 times. But I have found that getting the exam date on the calendar makes it all more real. My recommendation is to find a date that is close enough to keep you focused but enough time to align with your study plan. Your acceptance notice from PMI will provide all the information you need to schedule your exam. The exam is administered around the world through an organization named Prometric. You can find locations in your area by visiting the Prometric website. In step 1 on that page, select "Project Management Institute" as the testing program. Then select your region in step 2. You'll be taken to a screen where you can select "Locate a Test Site." Follow that link to see where the exam is offered. Some industries have certifications that are only offered at certain times of the year. The CAPM and PMP®are offered year around. Most Prometric centers have at least two 4-hour time slots: morning and afternoon. Some also have an evening slot and some even offer a weekend option. When are you at your best? Sign up for a time slot that best aligns with your best performance. Personally, I didn't want to have to think about it all morning before taking the exam later in the day. My test motto was "Let's roll!" (also known as "let's get this over!"). For detailed instructions on how to schedule your examination, click here to review PMI's official Examination Scheduling Instructions. It includes step-by-step instructions on how to schedule your exam. In addition, it explains the cancellation policies as well as what to do when you arrive at the testing center. There's no set time or process to prepare for the exam. It will depend on your personal preferences and availability. I chose a month, and during that time I went through my prep book about 3 times. I recently heard from a guy who I helped pass the exam. He decided to take longer, saying his preparation "was my life for the last 4 months outside of work." The big message: be prepared to sacrifice time, most likely at least 40 hours. You don't want to "wing it." You definitely want to show up knowing the material. Many people think the PMP® is a test of the PMBOK® Guide, which is actually not (completely) true! The CAPM® exam is more of a test of your knowledge of the PMBOK® Guide. The PMP® exam is based on the Project Management Professional (PMP)® Examination Content Outline. Certainly, the PMBOK® Guide is relevant, and worthy of using during your study. However, it's also worth taking the time to review the outline. The exam questions are driven by this outline. Make sure each task in the outlines makes sense. PMP®Exam Prep, 8th Edition--Updated: Rita's Course in a Book for Passing the PMP®Exam is one of the best prep books out there, and it's updated for the most recent PMBOK® Guide and exam. You might just learn some things about project management while you go through it, but you will definitely get the insights you need to pass the exam. You'll find many other resources offered by the author to help you pass the examination. If you're serious about passing the exam and want to use a prep book to do so, use the link on the right and get this book today. The lowest price I know of for this book is here. A must-have reference comes from PMI: A Guide to the Project Management Body of Knowledge: PMBOK(R) Guide. If you join PMI (I recommend you do), you can get a free electronic version of the PMBOK® Guide. If you prefer paper, get it for a great price at Amazon. The PMBOK® Guide doesn't read like a novel! But it's important for you to read. Approximately 75% of the questions on the PMP®exam are from the PMBOK Guide so make sure you read it at least once--and probably a good idea to read it twice. It's not sufficient by itself to help you pass. I know a good project manager that only used the PMBOK Guide, reading and re-reading it multiple times, which would be enough to put the best of us to sleep. Unfortunately, he didn't pass the examination. You need this guide for reference but you'll need other prep material to supplement it. I'm one of the reviewers on the Head First PMP: A Brain-Friendly Guide to Passing the Project Management Professional Exam book. I like the learning style of the book--particularly for those who don't like traditional textbooks. The test questions aren't as difficult as Rita's book but the content will help in your preparation. A final book I recommend is Kim Heldman's exam prep book. My favorite part of Kim's book is that she includes a supplement that can be accessed online. The supplement includes chapter summary audio, which you can listen to during your commutes. It also has flash cards that can be run from a computer or your mobile device. Finally, it has a test engine that allows you take a host of practice tests using your computer. Our exam prep students have found this is a great supplement to other exam prep materials. Getting good practice exam questions is really important in your preparation. The PMP®Exam Simulator is my favorite. It's very reasonably priced and you can get the first seven days for free without a commitment. I highly recommend it. Another great way to get your contact hours is Cornelius Fichtner's PM PrepCast™. I've had many people tell me they found it to be an excellent resource to helping them pass the exam, which is why I'm an affiliate of their products. We have a LinkedIn Group that is used by people who I've helped pass the exam. After they take the CAPM or PMP, they post lessons learned, including how they prepared, what surprised them on the exam, etc. I invite you to join the group (click here), request to join, and then review the lessons. See if you can find a friend or colleague that is going for certification as well. There's nice accountability and encouragement when you can go through the process together. You can quiz each other and help each other through material that is more confusing. Cornelius Fichtner's exam simulator. This is another great offering from Cornelius, and you can access the questions for free for 7 days. Oliver Lehmann's 75 free questions. His set of free questions are considered on the difficult side so don't get discouraged if you struggle the first time through. Oliver Lehmann's 175 free downloadable questions. Even more questions, available in a downloadable PDF. HeadFirst free sample PMP®questions. These are reasonably good examples of what you'll find on the exam. PM Study's free questions. This is a full free exam with a timer and elaborated answers. A measure of readiness is when you are consistently scoring in the 85 percentile or higher on practice exams. NOTE: If you re-take the same questions over and over, your percentages will continue to artificially rise. Make sure to regularly introduce new questions. It's the big day! One way to help you be at your best is to get a good night's sleep--not just the night before the exam but the days leading up to it as well. Don't go into this day tired because you stayed up all night studying. Similarly, make sure you eat a good meal before heading to the testing center. Don't go into the exam under-fueled. Some people have told me they drive to the testing center a day or two ahead of time to get a sense of what the commute is like. Some even walk into the testing center to see what it's like. Seeing it ahead of time can help when you walk in on exam day. You will have received instructions about what forms of identification to bring on exam day. Double-check that you have them before leaving your home. I recommend leaving home extra early so you avoid any extra stress caused by the commute. What Can I Take Into the Testing Center? The short answer: not much! I've heard some amazing stories of how high school and college kids have devised ways of cheating. Perhaps the most creative one was writing formulas or answers on the inside of a water bottle, in really small print, then re-applying the label. The magnification of the water made it an ideal cheat sheet! Let me be clear--I'm not trying to teach you new techniques! Don't try this! But my point is that testing centers need to avoid any chance of new and innovative ways of cheating. With that in mind, the official rules are that you won't be bringing in anything but yourself. In fact, in some testing centers, you may be asked to remove sweaters or other layered clothing. Phones, calculators, pens, etc. are off limits. There will be a soft calculator available on the computer for any calculations. Plan on a metal detector and maybe even a physical search that goes beyond just emptying your pockets. If you need to step out to use the restroom, to get a drink, or take medication, you'll need to sign out and back in. You might also be escorted. This may take more time than you expect so plan accordingly. If you have a medical condition that requires a special accommodation (e.g. requires you to eat, take medication, etc. ), there is a Special Accommodations Form that you should fill out ahead of time. This will allow you to get access to your locker at the testing center. If all of this sounds sort of over-kill, just remember it's designed to make sure no one has an advantage over you just because they found an innovative way to cheat. According to a discussion I had with PMI, "the reason why individuals who do not have special accommodations are unable to go into their lockers are due to exam security and to eradicate cheating. This policy should not vary by location." You will be provided with some scratch paper (which you'll need to return before you leave). Use this for your brain dump of formulas and other notes, effectively creating your own legal version of a cheat sheet. Prometric's official rules can be found at https://www.prometric.com/en-us/for-test-takers/prepare-for-test-day/frequently-asked-questions/pages/testing-center-regulations.aspx. PMI's specific rules can be found in this document. How Can I Calm My Nerves About Taking the PMP®or CAPM Exam? Years ago I was invited to give a presentation to a group of over 7,000 people at a Microsoft conference. I was so nervous ahead of time! A mentor at the time gave me great advice: "Andy, as soon as you stop puking you lose your edge!" Her point: if I didn't feel a little nervous it meant I didn't understand how big of a deal this was! It's OK to feel nervous. It's normal. Don't beat yourself up for feeling that way. Practice as if you were taking the real exam. Try to simulate the actual exam day. Don't take practice questions while you are laid back on a couch. Sit at a desk. Imagine it's test day. Take questions for an extended period of time to get used to the physical and emotional toll of multiple hours. This simulation will better prepare you for exam day. Write down your feelings. This is counter-intuitive to me. I would think it would be best to write down how confident you are and repeat it like a mantra. However, there's research talked about in the book Choke that suggests there is value in writing about how you feel nervous. It's OK to acknowledge it, and Sian Beilock's research suggest that getting it in writing--even just minutes before you take the exam--has value. Use interrogative thinking. This is from my interview with Dan Pink about his book To Sell is Human. Instead of trying to channel your inner Tony Robbins, ask questions. For example, "What have I done to prepare myself well? Why should I feel more confident? What is my plan to calm down on exam day?" This line of thinking has shown to be more effective than just the inner pep talk. Expect the exam to be difficult. In my interview with goal expert Heidi Grant Halvorson, she relates research that says it's much more effective to expect this to be a challenge than a breeze. Know in your heart that it is passable because it completely is if you have prepared. But expect it to be difficult. That combination of expecting to pass but anticipating it to be difficult can keep you focused while you prepare and on test day. Take a breath. On exam day, you'll likely get questions that you don't know. You won't even recognize the terms or concepts. It can be easy to be intimidated by these, especially if you happen to string a couple of these together. Take a breath. Relax. If you've prepared enough, you'll get all the familiar questions you need. Don't let the exam start to control you. You are the one who has prepared. You are the one with experience. Take a big breath, relax your back and shoulders, flash a smile back at the computer screen and nail the next question! The best way to be confident is to be prepared. Don't focus on whether you are (or are not) a good test taker. Amy Cuddy told me in an interview that generic affirmations are just wishful thinking. Instead, use affirmations of truth. What is true? Quiet the nerves by reminding yourself that you worked hard to get to this point and that you are prepared. There's plenty of time--don't rush. Answer every question. If you don't answer a question, it's guaranteed to be wrong. If you're not confident with your answer, make a note of the question number on the scratch paper that is provided. If you're quite sure (for example) that answers B and C are not valid, note B and C with an X through them on your scratch paper. This allows you to not start the thinking from scratch when coming back to it. Also, tell the exam system to mark the question for review, making it easier to find it later. After completing the exam, go back and review the marked questions. My recommendation is to only override your previous guess if you are strongly confident it was wrong. Otherwise, I recommend you trust your initial gut feel. You'll need to study because the questions can be tricky. There are often at least two reasonable answers for each multiple choice question. Your prep material can provide some pointers on what PMI is looking for. Memorizing the formulas (e.g. earned value, communication channels, etc.) is a must. But more importantly, know what the formulas actually mean. So, how many questions will you answer? How long will you have? Well, it depends on which test you will take. Don't under-estimate how challenging it is to stay focused for this many questions over so many hours. It can be mentally and physically exhausting so make sure you have some extended practice times to get used to the pressure. It will make it easier for you when you take the PMP®or CAPM exam. Don't panic when you come across a question that seems "out there." Eliminate as many answers as you can, then select your best guess. Mark it for review later, and then move on. Don't let them intimidate you. Be prepared to take the test in a setting that is far from ideal. There will be others on computers next to you taking certification tests as well (PMP, CAPM, or other). This means there will be background noise of keys typing and fingers tapping. The testing center will supply optional ear plugs but don't count on them working completely. Similarly, be prepared for the temperature to be either too warm or cold. Wear some layered clothing to allow you to adjust accordingly. NOTE: Some testing centers won't allow you to wear sweaters (or, if you do wear one in, you can't take it off during the exam). These are mostly annoyances that I share to help set your expectations about the environment you'll be in on the exam day. The examination is completely passable! To successfully pass the current PMP®exam (this has changed periodically), you must correctly answer approximately 106 questions out of the 175 scored questions (Wait! Aren't there 200 questions? They include 25 non-scored evaluation questions). Approximately 106? PMI is less specific now about the exact percentage. It's likely somewhere in the neighborhood of 61-69%, depending on the difficulty of the questions you get. Regardless, you're not faced with having to get 90% correct! The test is completely passable for those who work diligently at preparing! You can do this!